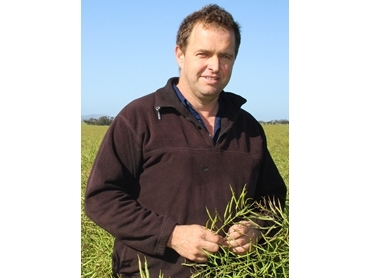 Grower Brian Klowss received a massive yield of a staggering 3.1 tonnes per hectare and 48.1 percent oil in his first attempt at growing a triazine tolerant canola hybrid. The Grass Flat grower had planted Open Pollinated and Clearfield varieties in the past, and decided this year to test the new variety Hyola 559TT. Mr Klowss explained the initial hybrid seed cost outlay amounted to about $45,000, which could be considered steep; however, the seed more than paid for itself by helping them secure over three tonnes per hectare and a $50 per tonne oil bonus on their contract. The grower was harvesting his 900 hectares of canola at Arapiles Plains last week when he registered the yield and oil data in a 90ha section of Hyola 559TT. His other variety, Clearfield crop Hyola 575CL, managed to keep up with the TT, scoring 3.0t/ha and 45.5% oil over 190ha. Mr Klowss, who owns the 3,200ha land and farmhouse built by his great-grandfather in 1905, said the farm was originally established as a cereal crop and sheep enterprise and canola was a recent addition. They still plant a lot of wheat, barley and oats, as well as vetches and clover, and currently have 3,000 breeding ewes. The multi-generational grower said canola types such as TT and CL have found favour in the area 35km west of Horsham due to their inherent ability to be dual-purpose break crops, reducing weed and disease pressure in subsequent cereal crops. The canola was incrementally helped by the weather, which was the best he had seen in decades. Mr Klowss’ property received 350mm in-crop rain since the April 18 sowing. To get his soil nutrients balanced he pre-applied 600kg of Gypsum, then sowed at a rate of 2kg/ha using minimum till methods, with plenty of subsoil moisture to get the crop going, and applied 90kg/ha of MAP at sowing with 30cm spacing. He also applied 130kg of urea before flowering to bulk up the crop even further, chasing high-end yields. Chemical applications during sowing and in-crop comprised of Atrazine at 1L/ha, 1L/ha of Lorsban for wireworm control, Lontrel at 100mL and Select at 450mL. Now that the season is over, Mr Klowss is contemplating next year’s plant, as well as other operations on his farm to boost his financials.